I was thinking about the concept of becoming excellent at something. My son is a budding artist. He and I had a conversation a few months ago about talent or aptitude. I said to him that I felt that aptitude is only latent: you need to put effort into something in order to expose your talent. He was concerned that he didn’t have any aptitude because he had to work so hard to become better at drawing. I compared him to myself and my brother, Alexei: when we were growing up, we both put a lot of effort into drawing. Quickly, I fell behind my brother in skill. He clearly had aptitude. But he also put in a lot of effort into exposing that talent. I was reminded of all this because my son is struggling with math. He has aptitude, but he hasn’t put much effort into it. I was wondering why? Then I realized that aside from aptitude and effort, two more things need to be in place to achieve excellence: willingness and confirmation. Willingness is the internal drive, usually motivated by an unconscious set of factors, but sometimes also coming from a strong conscious decision. Willingness can come from unusual combinations of circumstances. I was extremely willing to learn mathematics in my youth. This came from two experiences. One, in grade 2, was when my teacher told me that I shouldn’t be learning multiplication (my dad had taught me while on a road trip). I was upset that I shouldn’t be able to learn something. Then, in grade 3, I had a puppet called Kazir (a gift from my babysitter who told stories about space adventures with Azir and Kazir the Baha’i astronauts). I brought Kazir to school one day and while doing math problems, I pretended that Kazir was helping me. Suddenly I found math easy. These two events plus a few others contributed strongly to my desire, my willingness to learn math. Confirmation is the set of environmental factors that helps keep us on a path of learning. These environmental factors are sometimes mimicked in the corporate world with bonuses and gamification, but these are really distant shadows of what confirmation is really about. Confirmation is when the stars align, when everything seems to go right at just the right time, when the spirit inspires and moves you and the world to be, in some way, successful. The trick about confirmation is that success is not usually about monetary success. It’s usually about social, relational or even sacrificial success. As an example, when I was in grade 7, I was chosen with a small group of people in my class to do accelerated math studies. This was a great honour for me and was a confirmation of my interest in math. In organizational change, and in particular in changing to an Agile enterprise, we need to be aware that excellence requires that these four factors be in place. Aptitude is, to some degree, innate. We can’t trick people to have aptitude. If someone is just fundamentally bad at a certain thing, despite vigorous educational efforts, then that person likely doesn’t have the aptitude. Effort is about both having time and resources, but also, then about willingness. And willingness, in turn, can only be sustained with confirmation. Too much discouragement will break a person’s willingness. The Agile enterprise requires a great number of skills and abilities that are not normally part of a person’s work environment prior to attempting to adopt Agile. Keeping these four things in mind can help people in an organization to reach excellence in Agility. This is my first post on the Agile Advice blog. In fact, it’s my first blog post ever. 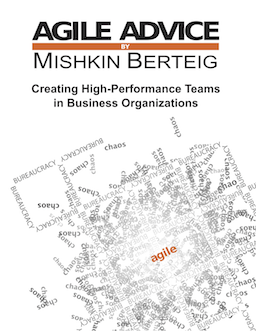 Before joining the Berteig Consulting team, I had never even heard the words Agile, Scrum, Lean, or OpenAgile. After all, my background is marketing, community relations, and sustainability! Needless to say, I’ve gone through some intense learning about the role of the Growth Facilitator. The responsibility of the Growth Facilitator is about more than simply prioritizing New Work goals and tasks. I see the role as contributing to the organizational culture, and helping to build the business in a sustainable way. “Sustainability” is an important concept at BCI. It means that we are committed to conducting business in a way that is respectful of the environment, society, and the economy. At the same time, it means that the BCI team operates at a sustainable pace, finding ways to balance our work and life so that we don’t burn out. As Growth Facilitator, I am also responsible for guiding the team toward delivering greater value for our stakeholders. At Berteig Consulting, our stakeholders don’t just include the company’s owners. Our stakeholders include a wide range of groups, including customers, suppliers, employees, and our families, all without whose support nothing we do would be possible. Delivering value to our stakeholders requires that we keep them in mind when we commit to our tasks each week. One of the important lessons I learned was to give the team S.M.A.R.T. – Simple, Measureable, Achievable, Relevant, and Timebound – goals and give them space to come up with the tasks to meet the goal. When I first started, I made goals that were broad, saying for example “to take care of our clients” or “to work at a sustainable pace.” Rather than stating goals, I realized that I was making statements of the team’s shared values. And while the team integrated these thoughts into our behavior, it was nonetheless challenging to spin off specific tasks that we could work on. Now, I try to ensure the goals I create conform to a user story format and meet S.M.A.R.T. criteria. For example “Berteig Consulting can update the Certified ScrumMaster course content so that all CSM course participants receive the best value in the market.” As soon as I made the direction clear, the team self-organized and generated tasks required to achieve each goal. Another key lesson of developing the direction for the team was allowing the Team Members time to review the next Cycle’s goals in advance of the Cycle Planning Meeting so that they could provide feedback and seek clarification. This became particularly important when one team member jumped on a business opportunity that created a significant amount of New Work. We simply could not overlook this great opportunity, and we moved it to the top of the New Work priority list and put it in the next Cycle Plan. Last, I learned that the Growth Facilitator and Process Facilitator have a complimentary relationship that requires frequent consultation. As the Process Facilitator goes about helping the team overcome obstacles, it can become clear that the team needs to address a systemic challenge during one of the upcoming Cycles. The Growth Facilitator then states the need as a Cycle goal in a S.M.A.R.T. format, allows the team time to give feedback, and prioritizes the goal in the New Work list. When the goal is brought to a future Cycle Planning Meeting, the team breaks the goal into tasks and solves the systemic obstacle that the Process Facilitator identified. These lessons have helped me understand how the Growth Facilitator role extends beyond prioritizing New Work and guiding the team’s value delivery. The role also fosters the culture in which the work gets done – working at a sustainable pace, taking care of our customers, and maintaining unity of vision. I would love to hear your thoughts about anything I’ve expressed here. Berteig Consulting is a deep-learning environment, and your feedback is invaluable.